Nobody loves the first sip of morning coffee like I do! In fact, I used to use this moment as an inspirational speech illustration on how to capture “Eden moments” in our lives. I still believe this is true. But this week, I had my favorite illustration taken from me! Due to a spike in blood pressure, I’m cutting out foods that may raise BP, and adding in foods that may lower it. One of the toughest things to give up was that sacred, holy, blessed… Cup o’ Morning Joe. Since I, like most people, am more motivated by pleasure than I want to admit, I had to find a substitute morning beverage that would be worth getting out of bed for. I’ve experimented with several alternatives. There was a canned non-caffeinated health/energy drink. It tastes like chilled, diluted cough syrup. No go. I tried various mugs of green and white teas, hot, with honey. They were nice, but hardly exciting enough to compel me to crawl from under the sheets. Not a fan of de-caf coffee. Then it hit me. Our cute local tea shop offers “tea slushies” during the summer months. I love them but they are a bit too sweet, full of sugar. 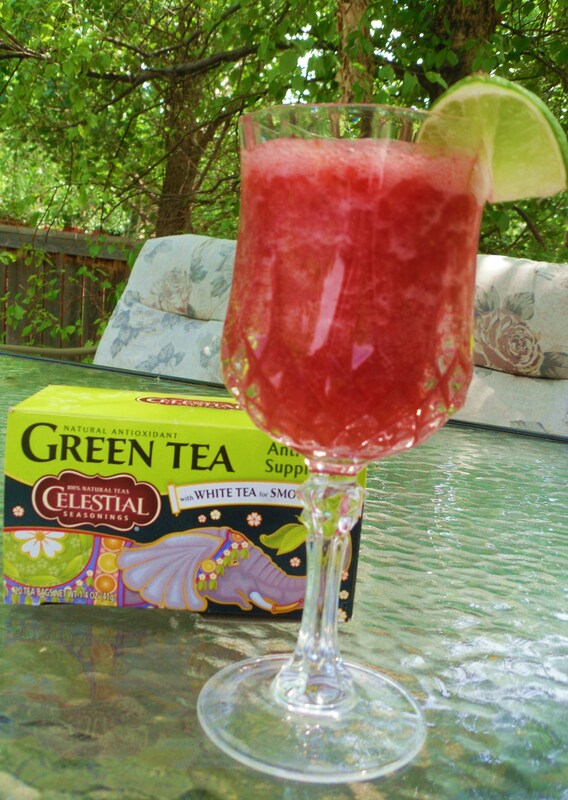 I also need to add more berries and fruit in my diet, so I wondered about making a white tea berry slushy. A little of this, and a pinch of that went into the blender and in no time, out came The Winner. (Insert angel voices singing here.) Meet my new morning beverage of choice. 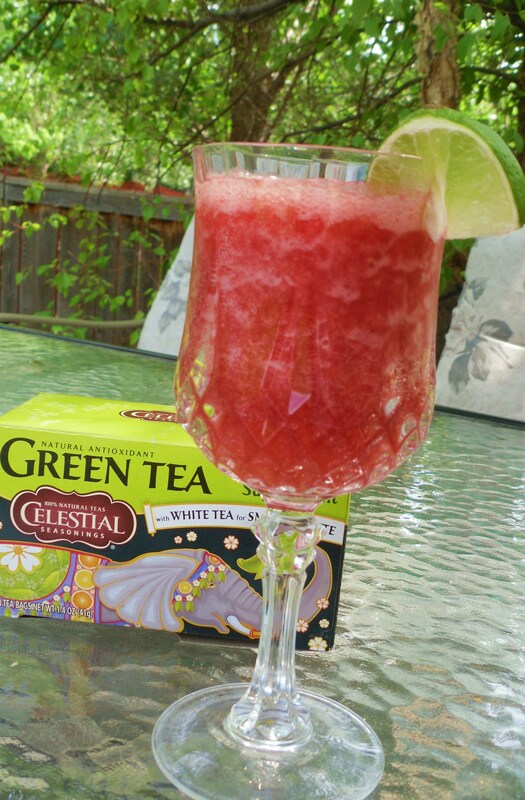 So perfect for back porch sitting and sipping, that I often enjoy an afternoon tea slushy, too. P.S. I like both green and white teas, but have found white tea has a milder flavor and even more nutritional benefits. White tea has been shown to fight cancer, help with weight loss, improve and protect the skin and the heart in a myriad of ways among many other benefits. I often mix it with decaf black tea and sip on this all day. Here’s an informative link: White Tea Information. Put all ingredients into a blender and whirl until slushy. Serve immediately, garnishing with a slice of lime, lemon or orange if desired. Variations: Try other teas. (A visit to a nice tea shop is like a visit to a cool wine bar these days!) Substitute other frozen fruits such as peaches, cherries, mangos or kiwis. Even veggies like celery and cucumber would be refreshing. Can’t wait to try this…even though I’m NOT giving up my coffee-induced, morning “Ah, that’s good!” This sounds like a perfect afternoon treat! Kari, I don’t blame you! I would not give up coffee if there were not a good reason to lower caffeine. (And I’m telling myself, “This is just temporary.”) But for now, this is a great little refresher. I tried it with mango, kiwi, strawberries today. Might try cantaloup with fresh mint tomorrow.